Geese arriving in the fall in Horicon Marsh. Photo by Jack Bartholomai. Through my posts I’ve shared a number of photos by Jack Bartholomai. Although he and Holly take photos wherever they go, their favorite site is the Horicon Marsh here in Wisconsin. 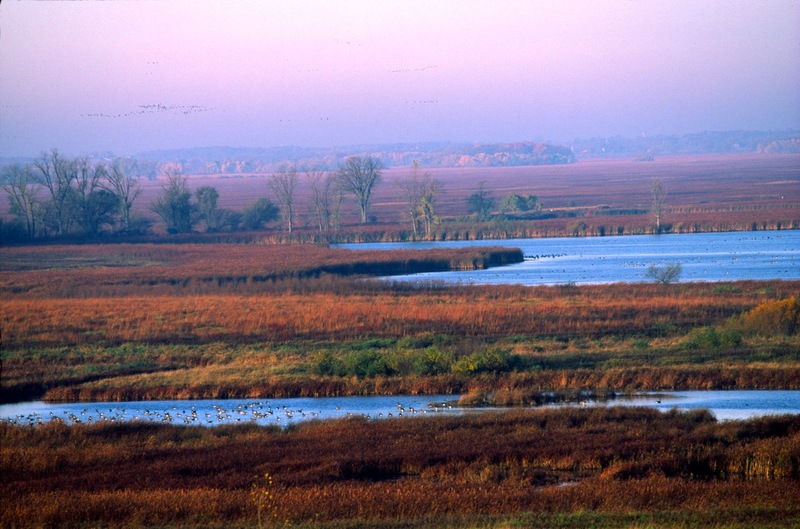 The Horicon Marsh is the largest freshwater cattail marsh in the USA. It consists of the Horicon National Wildlife Refuge and the WDNR Horicon Marsh and is recognized as a Wetland of International Importance by the Ramsar Convention of the United Nations. It is part of the Horicon Leopold Complex which includes the Fox River, Green Bay and Gravel Island national Wildlife Refuges, the Leopold Wetland Management District and of course the Horicon National Wildlife Refuge. It is managed by the USFW. Left in the wake of the last ice age known as the Wisconsin glaciation, Horicon Marsh is one of five separate lobes of ice pushed across the State. Left as a glacial lake, Horicon eventually became a marsh as the Rock River eroded its natural dam. Over time peat formed and it became a rich wildlife habitat supporting wildlife and humans for thousands of years — until European settlement. First it was the Europeans who damned it up to provide power for manufacturing. Then it was the market hunters who nearly destroyed the wildlife habitation. Then it was the farmers who thought they could tame the rich marsh by draining it and using it to grow crops. But, then nature took over and the dried peat caught on fire. Some old timers still say you can smell the smoke from the burning peat after all these years. The people of Louisiana and Texas should take heed.